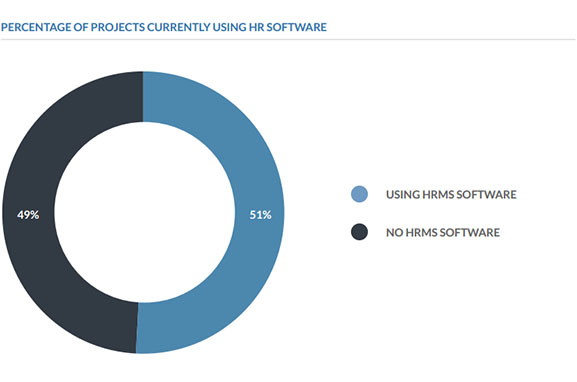 The 2016 HRMS Project Report gathers and analyzes data from conversations with key stakeholders and project managers on more than 200 HRMS software projects. ...the data in this report will make for interesting reading. As well as presenting data on HRMS project planning, requirements gathering and platform decisions, we have added our notes on what this data means for HRMS projects in 2017. 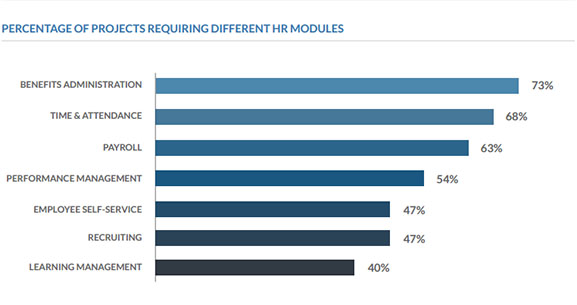 Just under 50% of organizations looking for HR software are first-time buyers. Whilst there are advantages to this - such as the lack of migrating data out of clunky legacy systems with poor integration - this situation also poses a number of challenges. Training first-time users will take longer than those who are used to HR software, and user buy-in may be harder to achieve. Rather than a reflection of popularity of certain modules, the above data could reflect which processes organizations are outsourcing or using separate systems for. Payroll and benefits management, for example, are often managed using separate but integrated software systems to ‘core’ HR functionalities such as performance management. 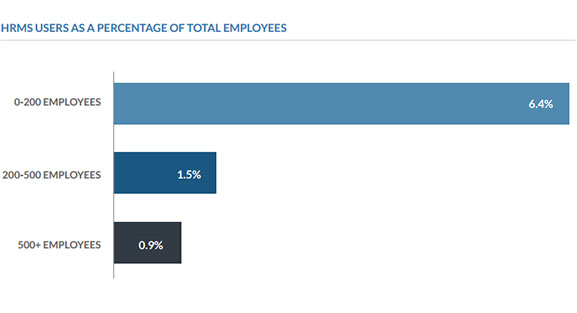 According to survey data, a significantly higher percentage of small business employees are active HRMS users than ones in larger organizations. This suggests small organizations should consult a wide range of departments when selecting a new HRMS, while medium to enterprise level organizations should take care in pinpointing key stakeholders and their needs. 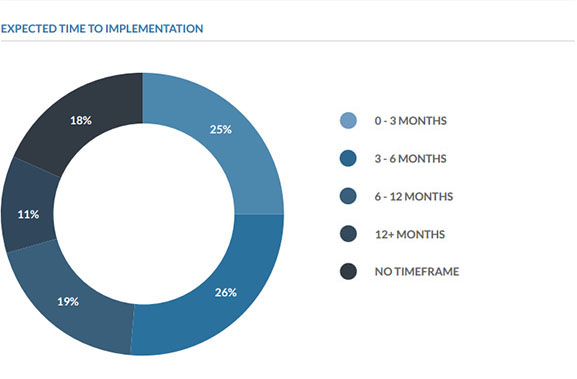 Over 50% of organizations embarking on a selection project expect to implement within six months. 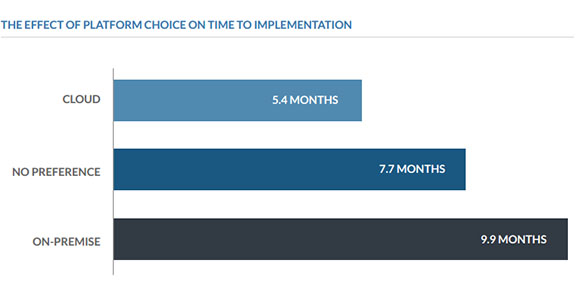 SaaS deployment options have made this goal much more achievable over recent years as shown by the reduced time to implementation seen in cloud projects. Organizations already using HRMS typically forecast significantly longer for implementing a new system. Perhaps this reflects more work surrounding data transfer from a legacy system, but it could also indicate naivety on the part of organizations implementing HRMS for the first time. Larger numbers of system users translate to longer implementation processes. More training, additional configuration requirements and more advanced functionalities all play their part in this, alongside the general logistics of implementing software across larger organizations such as those dealing with multiple sites. Cloud software is comparatively popular in the HR sphere - other types of enterprise software tends to have a more even split. Interestingly, 35% of organizations were still undecided when it comes to system platforms. This may reflect organizations which are still unsure of switching from legacy on-premise systems to cloud options due to the changes in security protocol and pricing structures. 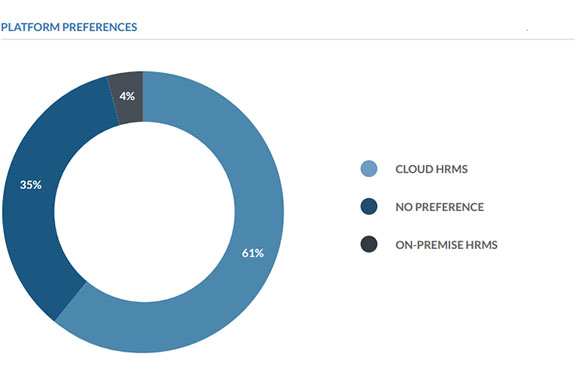 On-premise HRMS required a longer amount of time to implement than cloud HRMS. This is in line with trends seen across other types of enterprise software and reflects the significant amount of infrastructure changes required to implement a new on-premise system. If you have any questions on the data presented in this report, please email editor@convertedmedia.com. All data and graphics included in the report above are free to use with attribution under a Creative Commons BY-NC-ND license. Please let us know if you have referenced this data, we would love to hear from you. Data presented in this report was gathered from telephone interviews with project managers and stakeholders from 232 HRMS software projects. Data gathered from these conversations covered projects from a range of geographic locations, industries and company sizes. For further demographic information, please contact editor@convertedmedia.com. Data presented in this report was gathered from July 2015 - June 2016. The data presented in this report represents projects which have used HRMS World for project research and advice, and may not be indicative of the market as a whole. Comments on this data solely represents the views of individuals.